Advanced Persistent Threat (APT) is a network attack in which an unauthorized person gains access to a network and stays there undetected for a long period of time. The intention of an APT attack is to steal data rather than to cause damage to the network or organization. APT attacks target organizations in sectors with high-value information, such as national defense, manufacturing and the financial industry. More recent incident involved targeted attack on Sony Pictures. Traditional defense tools are failing to protect enterprises from advanced targeted attacks and the broader problem of advanced malware. Enterprises are spending billions of dollars on firewalls, intrusion prevention systems (IPSs), endpoint protection platforms and secure Web gateways. Yet, advanced targeted attacks (ATAs) and advanced malware continue to plague enterprises. Well-funded APT adversaries do not necessarily need to breach perimeter security controls from an external perspective. They can, and often do, leverage “insider threat” and “trusted connection” vectors to access and compromise targeted systems. Abuse and compromise of “trusted connections” is a key ingredient for many APTs. While the targeted organization may employ sophisticated technologies in order to prevent infection and compromise of their digital systems, criminal operators often tunnel in to an organization using the hijacked credentials of employees or business partners, or via less-secured remote offices. As such, almost any organization or remote site may fall victim to an APT and be utilized as a soft entry or information harvesting point. A key requirement for APTs (as opposed to an “every day” botnet) is to remain invisible for as long as possible. As such, the criminal operators of APT technologies tend to focus on “low and slow” attacks – stealthily moving from one compromised host to the next, without generating regular or predictable network traffic – to hunt for their specific data or system objectives. Tremendous effort is invested to ensure that malicious actions cannot be observed by legitimate operators of the systems. Malware is a key ingredient in successful APT operations. Modern “off-the-shelf” and commercial malware includes all of the features and functionality necessary to infect digital systems, hide from host-based detection systems, navigate networks, capture and extricate key data, provide video surveillance, along with silent and covert channels for remote control. If needed, APT operators can and will use custom developed malware tools to achieve specific objectives and harvest information from non-standard systems. At the very heart of every APT lies remote control functionality. Criminal operators rely upon this capability in order to navigate to specific hosts within target organizations, exploit and manipulate local systems, and gain continuous access to critical information. If an APT cannot connect with its criminal operators, then it cannot transmit any intelligence it may have captured. In effect, it has been neutered. This characteristic makes APTs appear as a sub-category of botnets. While APT malware can remain stealthy at the host level, the network activity associated with remote control is more easily identified. As such, APT’s are most effectively identified, contained and disrupted at the network level. How to Deploy the Most Effective Advanced Persistent Threat Solutions. The traditional defense-in-depth components are still necessary, but are no longer sufficient in protecting against advanced targeted attacks and advanced malware. Today's threats require an updated layered defense model that utilizes "lean forward" technologies at three levels: network, payload (executables, files and Web objects) and endpoint. Combining two or all three layers offers highly effective protection against today's threat environment. This style includes a broad range of techniques for Network Traffic Analysis. For example, anomalous DNS traffic patterns are a strong indication of botnet activity. NetFlow records (and other flow record types) provide the ability to establish baselines of normal traffic patterns and to highlight anomalous patterns that represent a compromised environment. Some tools combine protocol analysis and content analysis. Network Forensics tools provide full-packet capture and storage of network traffic, and provide analytics and reporting tools for supporting incident response, investigative and advanced threat analysis needs. The ability of these tools to extract and retain metadata differentiates these security-focused solutions from the packet capture tools aimed at the network operations buyer. Using a sandbox environment, the Payload Analysis technique is used to detect malware and targeted attacks on a near-real-time basis. Payload Analysis solutions provide detailed reports about malware behavior, but they do not enable a post compromise ability to track endpoint behavior over a period of days, weeks or months. Enterprises that seek that capability will need to use the incident response features of the solutions in Style 5 (Endpoint Forensics). The sandbox environment can reside on-premises or in the cloud. There is more than one approach to Endpoint Behavior Analysis to defend against targeted attacks. Several vendors focus on the concept of application containment to protect endpoints by isolating applications and files in virtual containers. 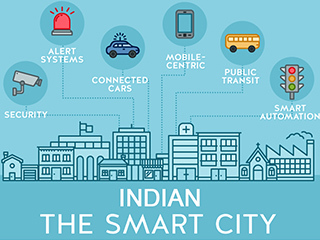 Other innovations in this style include system configuration, memory and process monitoring to block attacks, and techniques to assist with real time incident response. An entirely different strategy for ATA defense is to restrict application execution to only known good applications, also known as "whitelisting". 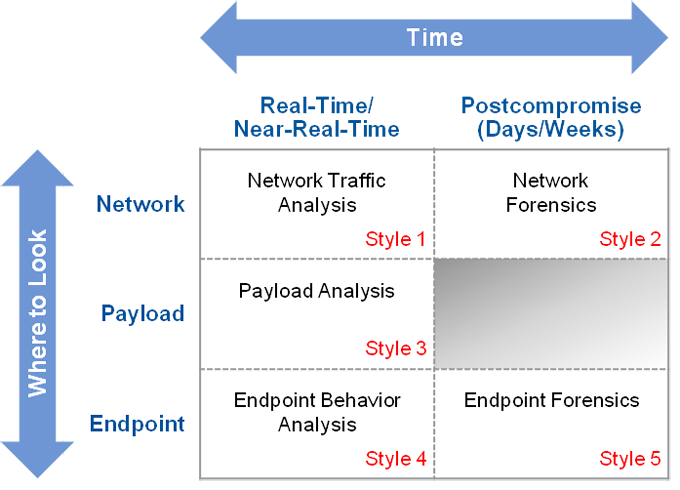 Endpoint Forensics serves as a tool for incident response teams. Endpoint agents collect data from the hosts they monitor. These solutions are helpful for pinpointing which computers have been compromised by malware, and highlighting specific behavior of the malware. Because of the challenges in combating targeted attacks and malware, security-conscious organizations should plan on implementing at least two styles from this framework. The framework is useful for highlighting which combinations of styles are the most complementary. Effective protection comes from combining technologies from different rows (for example: network/payload, payload/endpoint or network/endpoint). The same logic applies to mixing styles from different columns (different time horizons). The most effective approach is to combine styles diagonally through the framework.